Published January 22nd, 2010	in Money Saving Tools. 0 Comments	Tags: 401K, BrightScope, Pension. If you hover mouse over the stats you will get more details on what each of them means. You will also notice another important detail - when the data was last updated. For my company it is 12/31/2006 which is over 3 years ago! Sounds like eternity considering companies change plans every year. 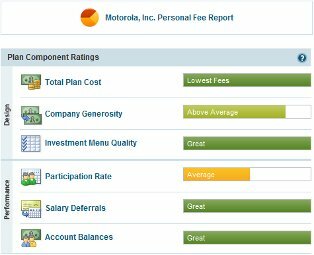 For example, Motorola recently suspended employee contribution matching (as did many other companies in 2009) and this obviously is not reflected by the charts. 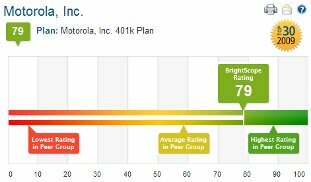 So finally there is a way to go and compare my 401K plan to those offered by other companies, something I honestly wanted to do for a long time. What about a different kind of metric, which companies offer the best plans in my industry? So far I couldn’t find how to see this with BrightScope but I hope the feature is coming soon. Are you maxing out your 401K contributions?